Conrad Dörr (Derr) was born in Norka, Russia on August 8, 1863, the son of Johann Adam Derr (born 1835) and Katharina Geiss (born 1839). Conrad married Elisabeth Pfenning in Norka on January 8, 1885. Elisabeth was born on August 28, 1866 in Norka, the daughter of Lorenz Pfenning (born 1835) and Elisabeth Pfenning (born 1840). Conrad and Elisabeth (Elizabeth) were parents to eight children. Six of the children were born in Norka: Katharina Elisabeth (born 1886); Margaretha Katharina (born 1893); Johann Georg (born 1896); Anna Elisabeth, known as "Alice" (born 1898); Katharina Louise (born 1900); Magdalena, known as "Maizie" (born 1903). Shortly after Maizie's birth the family migrated to the United States sailing from Liverpool, England and arriving in Philadelphia on May 28, 1903. Two more children joined the family: John (born 1905) and Ronald (born 1910). 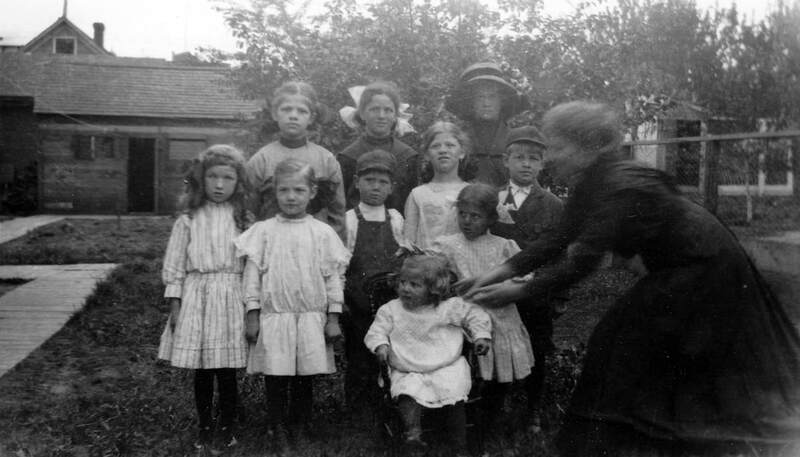 The family immediately joined a large group of Volga Germans who had settled in Portland, Oregon beginning in 1881. For many years the family lived at 760 Garfield Avenue (now 3536 NE Garfield Avenue) and Conrad worked as a machinist and boilermaker. The Derr family attended the Ebenezer German Congregational Church and later the Zion German Congregational Church. Mrs Schwartz (Conrad Derr's niece) and baby?, Elizabeth Derr holding son Ronald, Kate Derr Hart, Margaret Derr, Alice Derr. 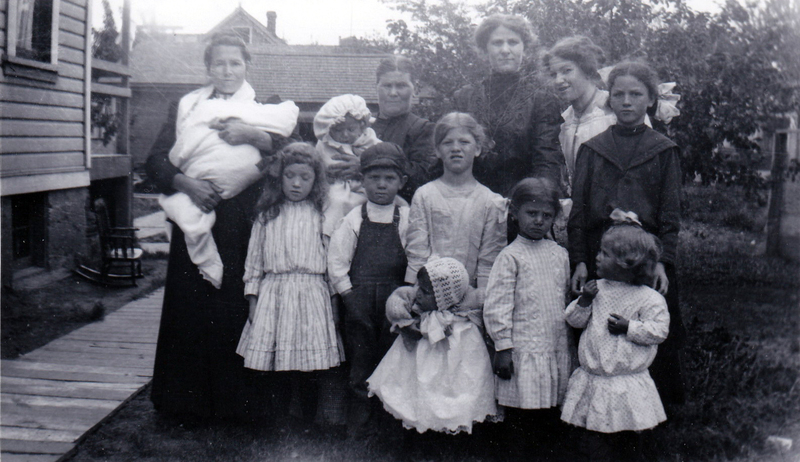 Bottom row Magdalena (Maizie) Derr, Johnny and Louise Derr, Louise and Marie Hart, baby? 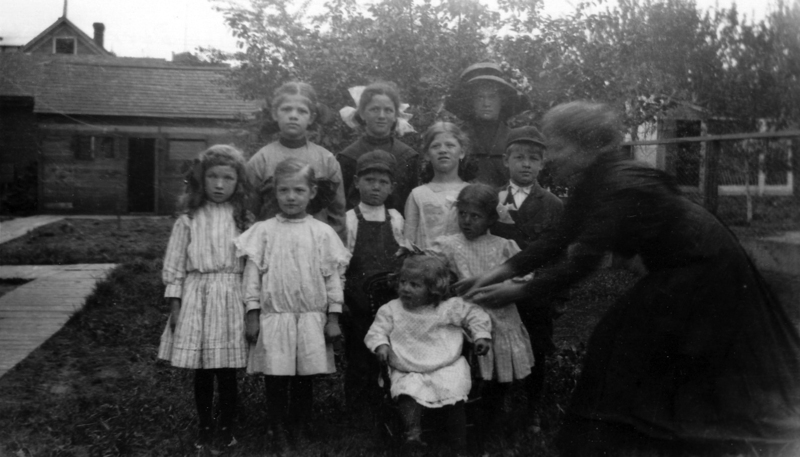 Photograph taken in the side yard of Conrad and Elisabeth Derr's home about 1910. Courtesy of Gina Stephenson. Back row from left to right: Libby Leel, Alice Derr, Marion Leel. Front row left to right: Magdalene( Maizie) Derr, Polly (Pauline) Leel, John Derr, Louise Derr, John Leel. Small children Louise Hart and Marie Hart. Kate Derr Hart comes n from the right. Photograph taken in the side yard of Conrad Derr's house at 760 Garfield Avenue (now 3536 NE Garfield) in Portland, Oregon. Courtesy of Gina Stephenson. Conrad and Elizabeth celebrated their 50th wedding anniversary in January 1935 when they renewed their vows in a ceremony performed by Rev. John Hopp. 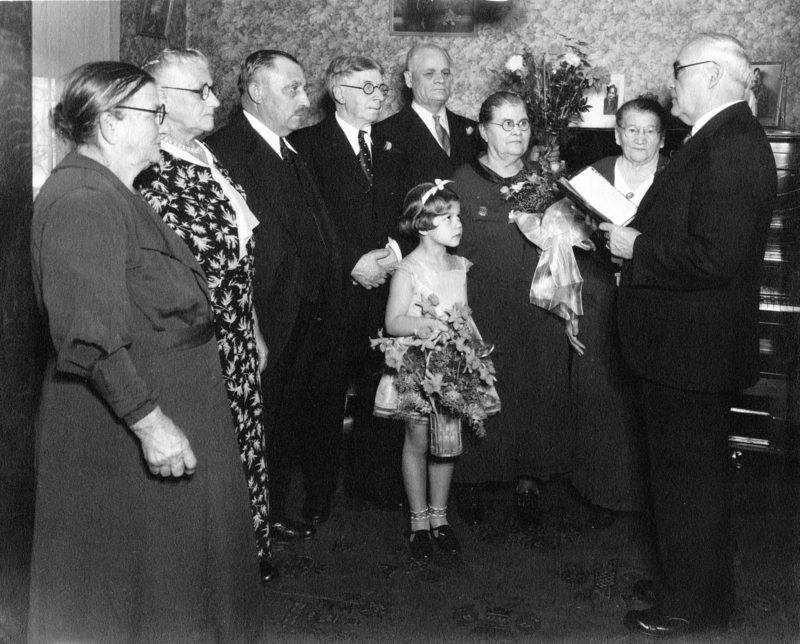 Photograph published in "The Oregonian" of Conrad and Elisabeth Derr's 50th Wedding Anniversary in Portland on January 28, 1935. From left to right: Katherine Derr, Margaret Pfenning (cousin of the bride), John Pfenning, Conrad Derr (groom), John Leel, Elizabeth Derr (bride), Magdalene Derr Leel, Rev. John Hopp. The flower girl is Barbara Olsen, the great granddaughter of Conrad and Elizabeth. Four of the people present at this anniversary observance were also at the original wedding in Norka on January 8, 1885. Mrs John Leel, who was Conrad's sister Magdalene Derr was the bridesmaid and John Pfenning was best man. Mrs. Pfenning (cousin to Elizabeth "Pfenning" Derr) and John Leel. Courtesy of Gina Stephenson. 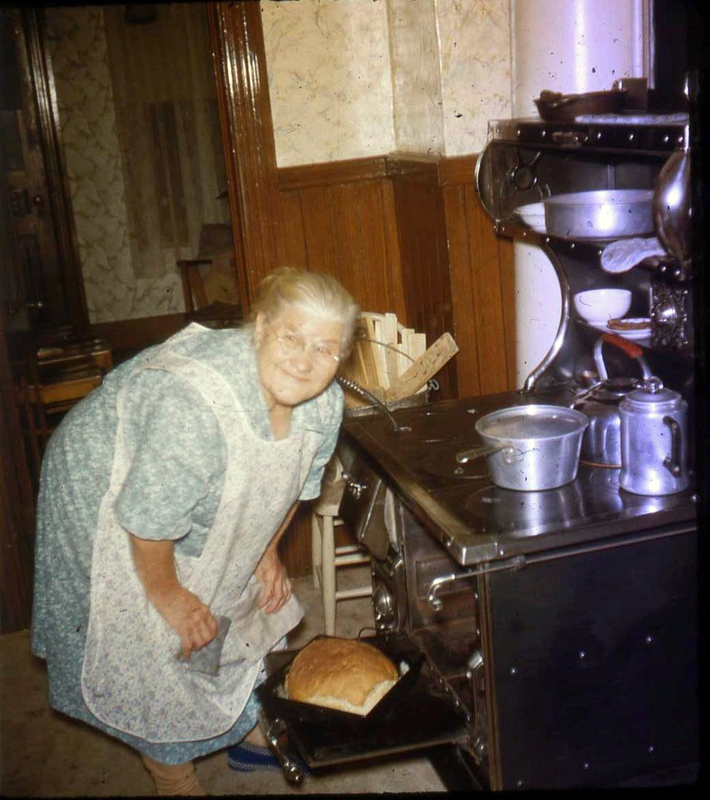 Elisabeth Derr (née Pfenning) bakes bread in her kitchen. Courtesy of Gina Stephenson. 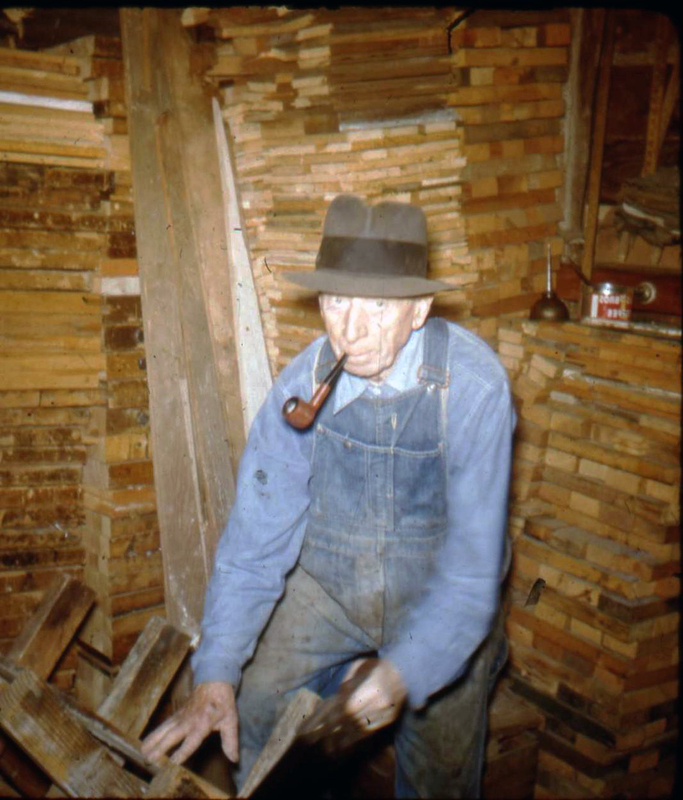 Conrad Derr cuts fire wood in his shed. Courtesy of Gina Stephenson. Elisabeth died on July 5, 1955 in Portland. Conrad died on August 21, 1959 in Portland. Both were buried at the Rose City Cemetery. Notable Volga Germans, Bob and Jim Beall, are descendants of Conrad and Elisabeth Derr. Gina Stephenson, daughter of Maizie Derr. ​Zion German Congregational Church Registers 1914-1967. U.S. Census of 1910 and 1920.